First of all, let me say that I'm totally freaking myself out over here. After a very long and exhausting day yesterday I was contemplating what the heck I was going to post about today whilst I was brushing my teeth. I was looking for something easy and thought about the fact that I haven't done a poll in a while. In fact, since it's award season and all (Golden Globes, etc. 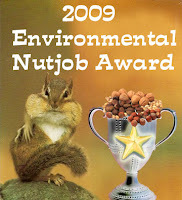 ), I thought I should do another Environmental Nutjob Award for today. So, I went and looked up when I had the last award (thinking it was sometime mid-February) when, lo and behold, it was on January 13th. Am I freaking bloggy clairvoyant or what? What does this mean? Maybe I should be trying to channel this amazing power into something more useful. Anyway, before I was struck down with the miraculousness of it all, I was also thinking about how the nominees haven't really changed over the last year. Which means either: 1. I'm stuck in a rut and don't get out much or 2. there really aren't too many new nutjob environmentalists on the scene. I'm not sure which is more accurate, but I did try to shake things up a bit by adding in a few new faces. That said, I think it will all come down to (again) a bitter fight between Sharon and Greenpa. May the bigger nutjob win! Unleash the minions! I vote for you Crunchy, you make me laugh as well as enjoy my life of green, simplicity. And Sharon! pah- they still do their business INSIDE. eco-sissies, for sure. I'm voting for Greenpa. I know Sharon IRL and she's not a nutjob really. I do wonder how she gets anything accomplished at all. Crunchy, I hope your life gets less hectic soon. I'm so honored to be nominated. If I had known there was an award, I would have been way more nutjobier! I've got to go for the Hausfrau. Either she's on track and the rest of the world is nuts, or she's a nutjob. Being as I have the ostrich head the in the sand tendency, I'd like to hope she's kinda nutty. Well, Hausfrau knows I really like her because I voted her a favorite blogger a few months back. Don't hate me now Hausfrau! Sssshhhh...Amy, don't ruin my chances of winning the award! Am too a nutjob! ;-). Sharon - You must be slipping, girl. Last year you were spanking Greenpa's, well... I don't want to give him any ideas. I mean, with all due respect, no running water, much less hot water? That's pretty nutty. I mean that in the best possible way. e4 - Holy crap! I haven't been reading her blog. I didn't know that was what she was up to! "I mean, with all due respect, no running water, much less hot water?" You do realize- Greenpa's had no running water, much less hot water, for over 30 years?? that being said> I would have to vote for Greenpa just becaue I admire his outhouse. um. hello! Why is the award limited to bloggers? Would an award winning environmental nutjob actually use something as resource intensive as the internet? Surely, there's someone out there who has a slate that's hooked up a plotter driven by a team of clairvoyant squirrels who commune with the internet and translate that via the plotter to the slate whereby the environmental nutjob can access the internet without all the carbon. . .
So- where are you sending the news releases? Salon, I'm sure. NPR. AP. Reuters. And when do my Green Globes arrive?